Dirty Pictures is an award-winning film about the life and work of Sasha Shulgin, directed by Étienne Sauret, an independent documentary filmmaker based in NYC who has produced and directed feature documentaries for over twenty years. Alexander Sasha Shulgin is the scientist associated with more than 200 psychedelic compounds including MDMA, more commonly known as Ecstasy. Considered to be one of the greatest chemists of the 20th century, Sasha’s vast array of discoveries have had a profound impact in the field of psychedelic research, making him a subject of fascination and controversy among fellow scientists and a folk hero to recreational users of psychedelics. 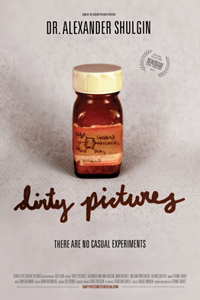 Dirty Pictures uncovers the lifework of Dr. Shulgin and takes viewers inside his Northern California home where he lives with his wife of 33 years and continues to carry out experiments in a makeshift laboratory. Director Étienne Sauret likewise delves into the broader world of psychedelic research where the fields of chemistry, neuroscience and philosophy intersect and investigates whether or not this particular field could aid in solving the deepest mysteries of the human mind.